Full length protein. Human leucocyte elastase. Our Abpromise guarantee covers the use of ab21595 in the following tested applications. IHC-P 1/20 - 1/200. PubMed: 20837529We recommend antigen retrieval in a steamer or with 0.04% pepsin for 10 minutes at room temperature. See Abreview. WB 1/200 - 1/500. Predicted molecular weight: 29 kDa. ab21595 staining Neutrophil Elastase in rat cornea tissue by Immunohistochemistry (Formalin/PFA-fixed paraffin-embedded sections). The section was deparaffinized with ethanol and the antigen was retrieved using a steamer. ab21595 was used at a 1/200 dilution, the secondary was an anti-rabbit IgG 1/5,000 also from Abcam. The DAB staining was performed using a DAB Peroxidase Substrate kit. The slides were counterstained with hematoxylin. ab21595 staining neutrophil elastase (NE, green), DNA stained with propidium iodide (PI, red) in COPD sputum by ICC/IF (Immunocytochemistry/immunofluorescence). The sputum matrix contains condensed matrix traversed by thin neutrophil extracellular traps (NETs) strands associated with bacteria (arrowheads), non-activated polymorphonulear neutrophils (PMNs) (open arrow) and NETotic PMNs (solid arrow); asterisks indicate fully spread NETs.Cells were blocked with 10% normal goat seum in PBS containing 10 mM glycine and 0.2% Tween 20. Samples were incubated with primary antibody (1/50). ab96883 (1/100) was used as the secondary antibody. ab21595 at 1/20 dilution staining rat liver tissue sections by Immunohistochemistry (Formalin/PFA-fixed paraffin-embedded sections). The rat was challenged with LPS at 100ug/Kg i.p. The tissue sections were formaldehyde fixed and incubated with the antibody for 2 hours. 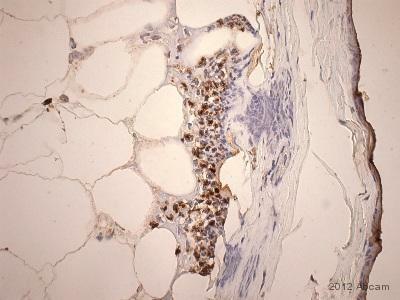 A biotinylated goat anti-rabbit IgG antibody was used as the secondary antibody. 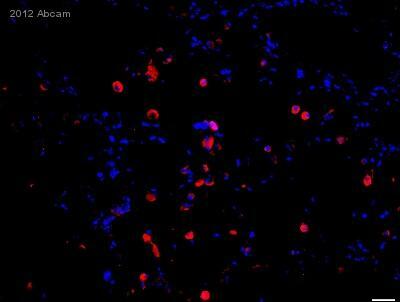 Hello I recently purchased the anti-neutrophil Elsastase antibody (ab21595). However now that I have received it, I can see that there is no concentration indicated on the datasheet. Can you perhaps inform me of the concentration of this antibody? According to the datasheet, this antibody is a non-purified whole serum product. That means, along with Ascites and cell culture supernatant products, the antibody concentration cannot be determined as there are too many other proteins in this solution as well. However, we have a table under our Technical FAQs (What concentration of primary antibody should I use?) which explains how much specific antibody can be expected in the non-purified products. In addition, it will give you a starting point for the dilution of your antibody in different applications. I am using your neutrophil elastase antibody (ab21595). I have serious problems with background. I used several different primary and secondary antibody dilutions, blocking reagents, incubation times and temperatures, as well as different secondary antibodies but no improvement on my blot. I attached a developed membrane loaded with 0-400nM pure elastase, stained with 1:500 neutrophil elastase antibody (a b21595) for 1h in TBST+ milk and 1:50000 secondary anti-rabbit HRP. The membrane was exposed for 30sec. Every exposure time longer than 1min results in a total black blot. This background just occurs with the neutrophil elastase antibody (a b21595). Other antibodies do not give any background with similar Western Blot conditions. Having reviewed this case, I would like to offer some suggestions to help optimize the results from ab21595. I would also appreciate if you can confirm some further details: Sometimes the antibody may react with your blocking solution to create this type of issue. If you have not yet changed this, we would suggest the use of an alternative blocking solution such 3-5% BSA in place of milk. Have you increased the stringency of your washes by increasing time and frequency as well as the addition of a detergent such a Tween? Does the blot glow when adding the ECL reagents? If so we recommend letting the blot rest for some time (up to 1 hour) before exposure. Should the suggestions not improve the results, please do let me know. I would like to learn about the differences between your products ab68672 and ab21595, which are both directed against neutrophil elastase. I realize that the immunogens used were different, I just want to know which one to use for my frozen mouse sections in order to get good elastase pictures? Elliott CG et al. Periostin modulates myofibroblast differentiation during full-thickness cutaneous wound repair. J Cell Sci 125:121-32 (2012), Supplementary Material, figure S1. Detection was with peroxidase-conjugated secondary antibodies. Either one of these antibodies would be suitable and would be guaranteed to function in IHC-Fr in mouse. 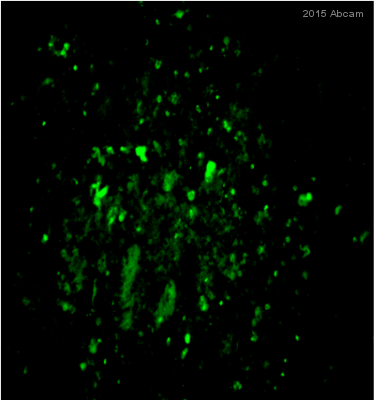 tested ab21595 in immunofluorescence applications. show in that paper. Please feel free to use those blots on the datasheet. I just thought I would draw your attention to this error. Ich habe diese wertvolle Information an unsere Datenblattabteilung weitergeleitet, und diese sollte das Datenblatt dann so schnell wie möglich aktualisieren und den Fehler beheben. Nochmals Danke für Ihre Hilfe, unseren Service zu verbessern! der Antikörper ab68672 hat leider weder auf bovinen Neutrophilen von Cytospins noch im Paraffinschnitt von Kühen funktioniert. Ich werde diese Woche noch die AbReview anfertigen, möchte Sie aber schon jetzt fragen, ob Sie noch irgendeinen anderen Antikörper im Sortiment haben, der bovine Neutrophile markieren kann. Frau Zeeck ist in Ihren wohlverdienten Urlaub und deshalb muss ich Ihnen heute die schlechte Nachricht überbringen, dass wir keine anderen Antikörper haben, die bovine Neutrophile Elastase erkennen. Leider muss ich auch bestätigen, dass auch unsere Antikörper gegen den Standard- Marker für Neutrophile Ly6G nicht für Rind geeignet sind. Bitte lassen Sie mich wissen, ob Sie noch einen anderen Marker für praktikabel halten und ich schaue gerne nach, ob wir einen Antikörper haben, der möglicher weise auch Rind erkennt. Wir freuen uns auf den Review und möchten Ihnen versichern, dass wir auch negative Reviews veröffentlichen und für hilfreich und informative ansehen. Inquiry: Hello, Is it possible to get the concentration of the following antibody we have currently purchased, please? : Anti-Neutrophil Elastase antibody (ab21595). Thank you very much. Thank you for your enquiry regarding ab21595. This antibody is not affinity purified but whole antiserum so the concentration if IgG is not determined. However, it is normally between a range of 10-15 mg/ml.